Oh, chocolate pie. How I love thee. My mom used to make chocolate pie every Thanksgiving because *some* of us didn't/don't like pumpkin pie. Some of us being me. It's the spices. I'm just not a big fan. 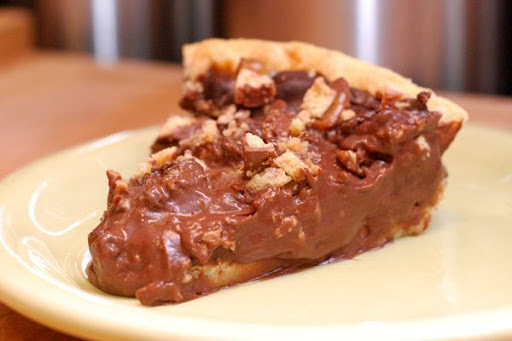 So, I have this fondness for chocolate pie. 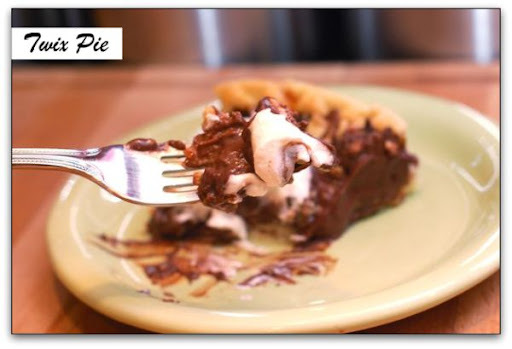 It reminds me of my childhood, and I love digging into a piece of smooth, creamy chocolate-y pie. This recipe is really, really easy. 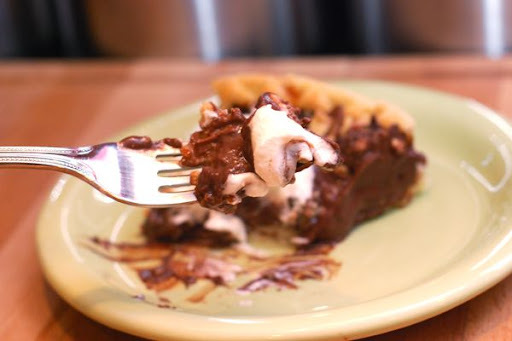 Using boxed pudding mix, a frozen pie crust, and a pile of Twix bars, you can make a really easy, really delicious chocolate pie. 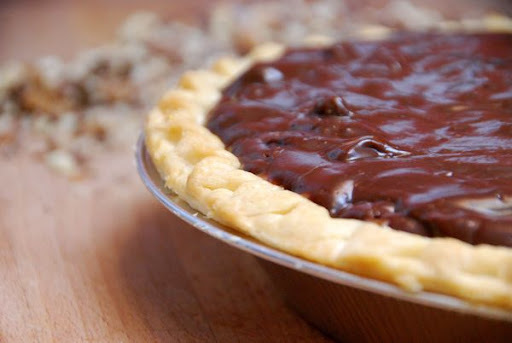 It's not a graham cracker crust or Oreo crust pie - this pie needs a regular pie crust. 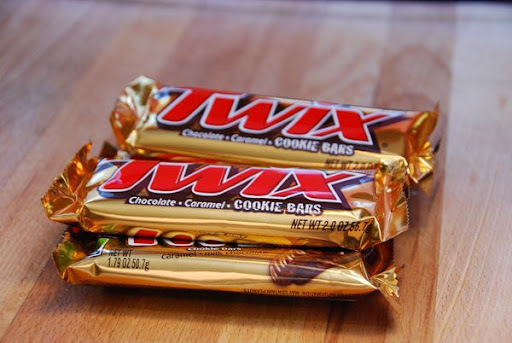 And, by cutting down the sweetness of the filling, the Twix bars add just the right touch. Buy one (or two) frozen pie crusts. 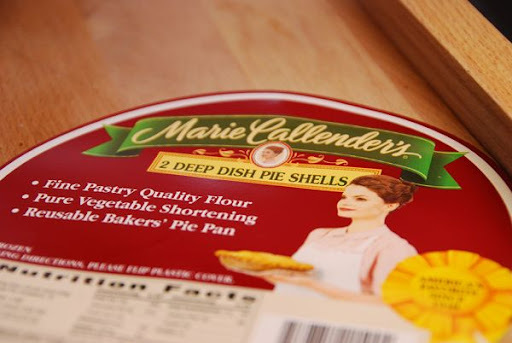 I like Marie Callender's deep dish crusts. 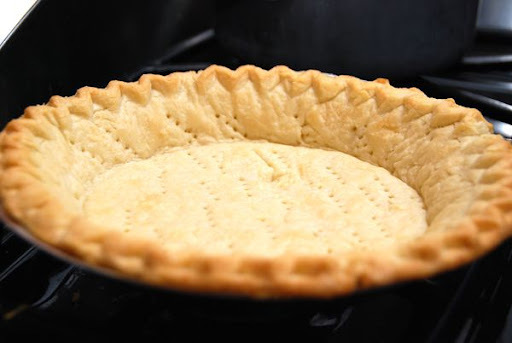 You can make homemade pie crust too, (see recipe here), but since we're going for quick and easy, a frozen crust works great. Bake according to directions. (Typically, you prick the pie crust with a fork and bake for about 12 minutes). 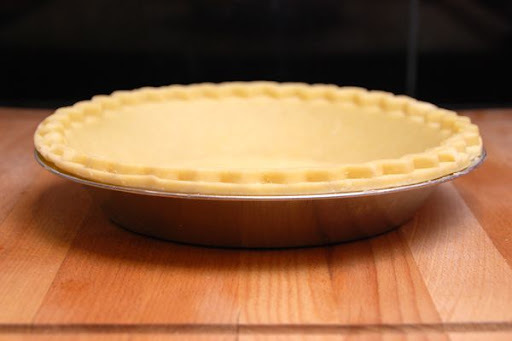 Set pie crust aside to cool. 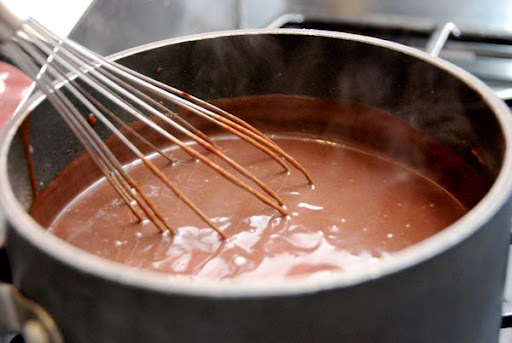 Combine 3 1/2 cups of milk and 2 small packages of cook and serve chocolate pudding in a medium saucepan. You really need to use cook and serve pudding. Instant pudding won't work in this recipe and it really isn't as good anyway. This part is really important. 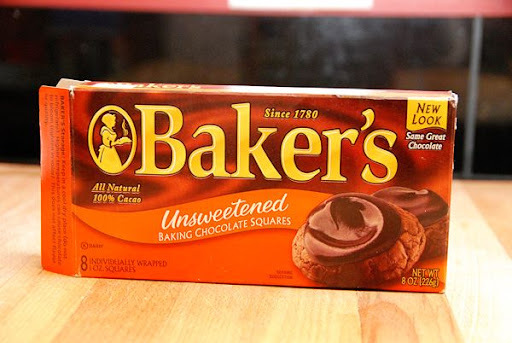 You need 2 (one-ounce) squares of unsweetened chocolate. This will cut the sweetness of the filling and help the pie to taste much more upscale. Trust me on this one. 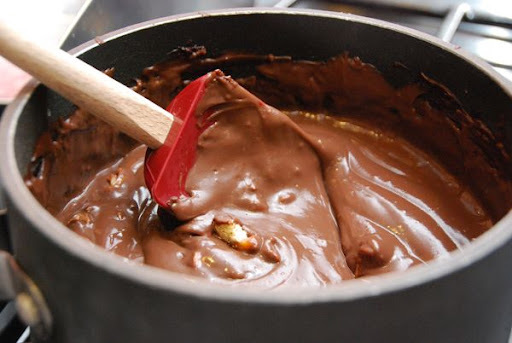 Add the squares to the filling and stir with a whisk just until it boils and the chocolate is melted and smooth. Chop them with a knife into small pieces. Add half of them to the pie filling. Stir until combined. I ate 7 bites of this stuff here. I couldn't help myself. 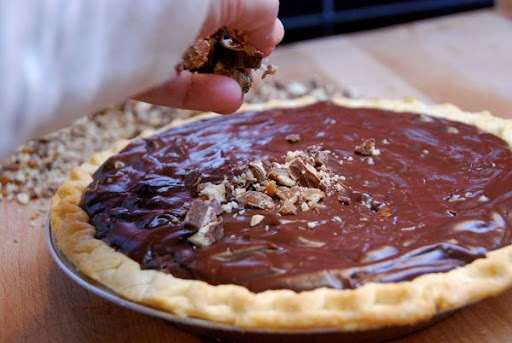 Pour whatever is left into the cooked and cooled pie shell. See how some of the caramel has started to melt? Sweet mercy! I love this pie. But, I will love it even more in a minute. 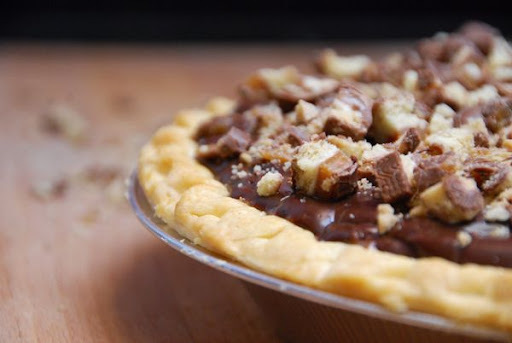 Top the pie with the rest of the chopped Twix bars. And, now for the finish. Fresh whipped cream. Right before you're ready to serve the pie, pour one cup of heavy whipping cream into a mixing bowl. And, serve up the pie. It's not thick, dense pie. It's not as thin as pudding. It's right in between. It's perfectly creamy and smooth, with bits of Twix bar in every bite. It's not too sweet, but just right. Bake pie shell according to package instructions. Set aside to cool. 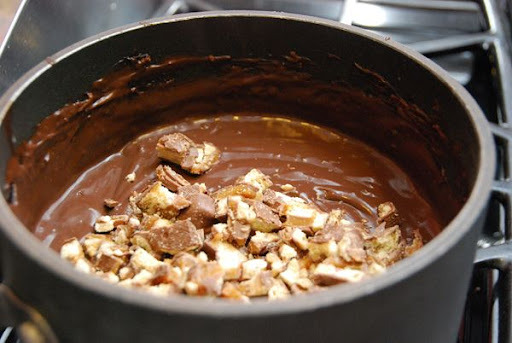 Combine pudding/pie filling and milk in medium saucepan. Cook over medium heat. 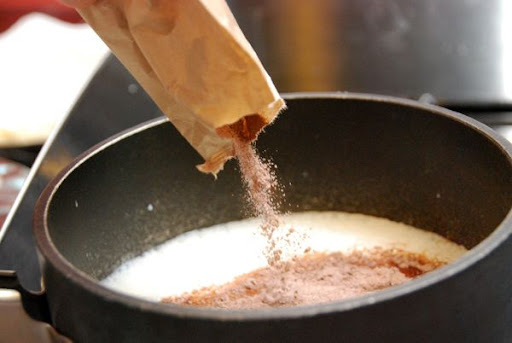 Add unsweetened chocolate squares. 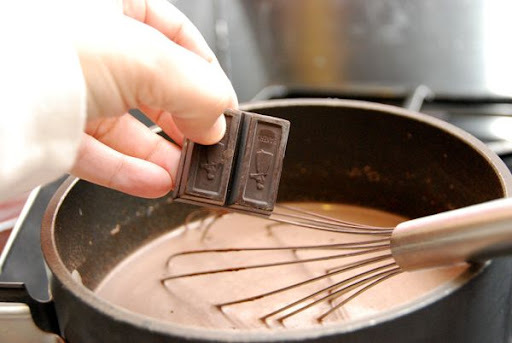 Cook until just boiling and chocolate is melted and smooth. Turn off heat. 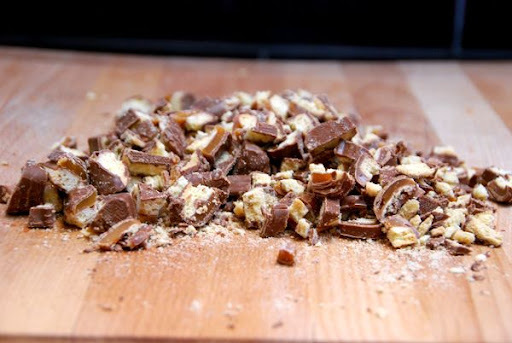 Add 1/2 of chopped Twix bars and mix until smooth. Pour filling into baked and cooled pie crust. Top with remaining chopped Twix bars. Refrigerate for at least 3 hours or overnight. 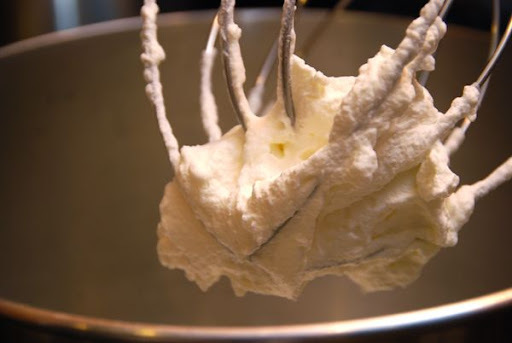 When ready to serve, make whipped cream. 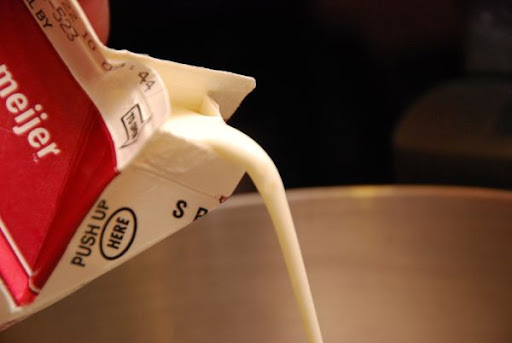 Pour one cup of heavy whipping cream into a mixing bowl. 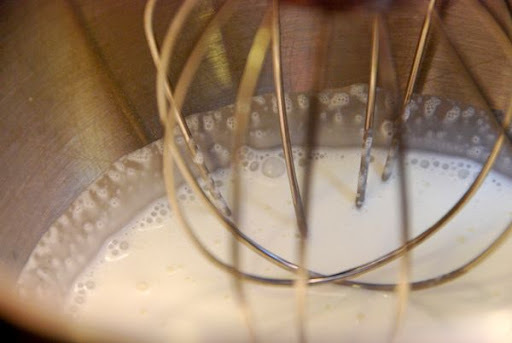 Add sugar, and beat with an electric mixer of wire whisk until peaks form. Serve pie topped with whipped cream. *You can use whatever candy bars you like: Snickers, Heath Bars, Three Musketeers, etc. It's totally up to you! Looks like a winner! I'll be making this for my chocolate loving husband. Thanks for using REAL whipped cream! I could eat that stuff by the spoonful. Oh my this looks fabulous! I've been looking forward to this post since your fb status Sunday. Love the shot you took of the sugar going into the cream... you had to be proud of yourself for that one!! Quick question: I have a refrigerated pie crust, not frozen...think it'll work just as well? We're going to a friends house for dinner next week... perhaps we'll bring this for dessert...if I can wait that long to make it! Oh Yum! It looks wonderful! Amazing sugar photo!!! I will tackle this on Saturday. Thank you! It's actually 5 packs of Twix bars, so 10 individual sticks. My grocery store actually does them buy 3, get 2 free at the checkout counter a lot, so that's why I use 5 packs. You can use as many or as little as you like, though! This pie looks soooooooo delicious! This looks amazing. And I don't even like chocolate. My husband will love this. I stumbled upon your blog yesterday for the first time while searching for a Strawberry Pie recipe (which I am making tonight! )....I had no idea I would fall so hard in love with this blog! You are so refreshing and spunky! Congrats on your upcoming arrival and God Bless your family! Oh, I can hardly wait...mmmm! You could freelance for Food Network online! You are awesome! I want to make the pie just because you make it look easy and yummy! I'm pretty sure they will be serving that in heaven. YUM. Gulp. Are you kidding me?!? Sweet mercy. Finding this post TOO tempting. Just looking at the picture is putting on lbs. ! It looks wonderful but my resistance is getting low every morning I see it! Could I make it I wonder without even trying it - I know the answer to that. After seeing the pictures I had to make this... I made it on Saturday for a hang out on Sunday (3/14)... did you know that yesterday was "pi day"... March 14... 3/14... 3.14... so I became the person who made a pie for pi day... they quickly stopped making fun of me after trying the pie! It was amazing! This looks amazing. 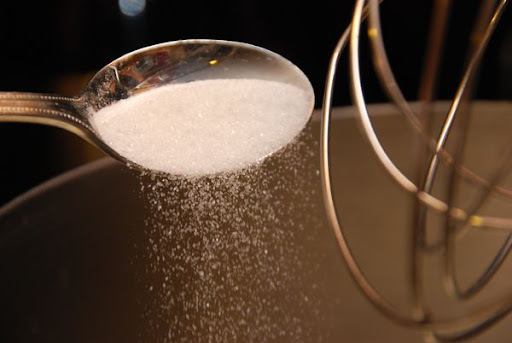 Oh, and that picture of the sugar, falling off the spoon -- completely awesome. Oh.My.Word! Heaven on a plate for sure. I will definitely be trying this one. Good heavens. I can taste it now! I have loved many of your recipes and so I jumped right into making this, and unfortunatley it was not a hit with my family. It was just too sweet. They wanted the plain ole choclate pie ... no Twix. 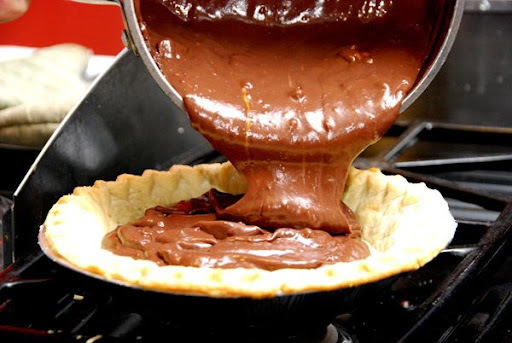 Im trying to make this pie but here in mexico i cant find the cook and serve chocolate pudding. Any suggestions?